Tired of having to mix your protein drink in a shaker bottle? Using a protein shake blender will create smoother protein drinks and save you time. I’ve done the research to help you decide on the best blender for protein shakes that meets your needs and budget in 2019. If you just want to mix basic shakes (powder with liquids) like Shakeology or Herbalife shakes, then you will be fine with a low-powered blender with at least 200 watts. If you want more variety of ingredients in your protein shakes like fruits, vegetables, nuts, or ice cubes then you will need a stronger blender with power of at least 500-600 watts to do an adequate job..
For protein shakes, a lot of people find that personal blenders work perfectly because they are easy to clean and store. Personal blenders are also convenient because you can drink right out of the blender jar after blending. A full-size countertop blender makes more sense if you want larger portions or need a blender than can perform a wider variety of blending tasks. For blending jar size, is it usually relative to the power of the blender. A low powered blender generally will have a smaller cup size and a high speed blender can have jars that get up to 50 ounces. For a personal blender you will usually see 18-24ounce jar size and countertop blender in the low-40ounces. The above criteria as well as consumer reviews, independent blender test results, brand reputation, and price were all consider in narrowing it down to the following six blenders. 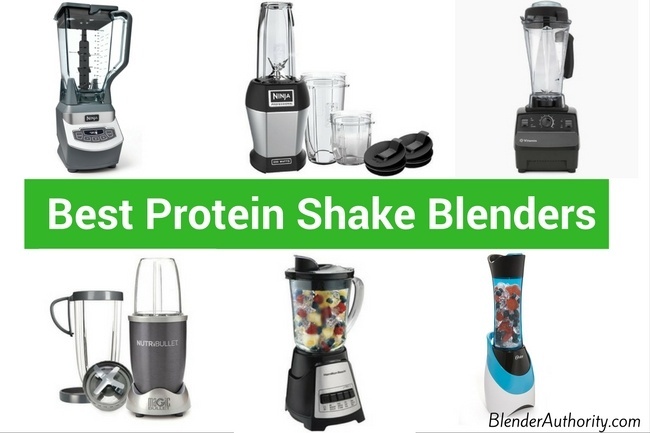 Also, I have divided this list of the best protein blenders into single-serve personal blenders and full-size countertop blenders. 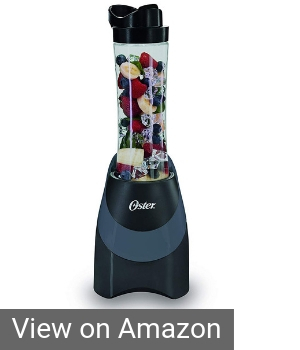 The Oster My Blend is a basic 250 watt single-serve blender that will work great for blending simple protein shakes. It has a 400 watt peak motor (250 watt blending watts) with simple one-touch control. The blending jar is actually a 20ounce BPA-free sport bottle so you can just blend and take your drink on the go. Positives: It is cheap and has positive feedback with 1000’s of reviews. Simple to use and it works. Good Housekeeping Institute tested the My Blend blender and said it was a top choice for protein shakes and blended drinks. It also did well making blending margaritas and grinding coffee beans. Negatives: It is for small portions. There are some reviews that said it struggled with ice. Overall Opinion: A great compact blender for the price that works fine for simple protein shakes and small blending tasks. Perfect if you want a portable travel blender. Overall, the Oster My Blend is the best blender for protein shakes if you want a simple, low cost option. It comes in various colors but we just linked to the popular model that comes with an extra blending jar. The Nutribullet 600 is an upgrade to its Magic Bullet blender and is more powerful than the Oster My Blend with 600 watts and provides more accessories so you can blend, dice, and mill grains. Has a 24oz capacity and with extra cups and a blade for milling. The jars come with lids so you can take your blended drink on the go without having to clean an extra pitcher. Positives: Works very well and can do basic food prep, make whole food smoothies, make nut butter, and grind flour or seeds. It easily blends difficult ingredients like nuts, fibrous vegetables, and fruits with seeds. The Nutribullet 600 will last longer than a cheap blender. Negatives: More expensive than the Oster My Blend and might be more than you need if all you want is a basic protein shake blender. Overall Opinion: If you want a personal blender that can not only blend protein shakes but also make a wide range of healthy smoothies then the Nutribullet is a good choice. It can blend almost any ingredient that you put into it and won’t overheat like cheaper personal blenders. Like the Nutribullet 600, the Nutri Ninja Pro is another popular personal blender. It has 900 watts and a 24 ounce jar capacity. It comes with a 24oz jar and a 18oz jar. Each jar comes with flip top lids. Positives: the Nutri Ninja Pro continues to be a bestseller and is perfect if you want a simple but powerful blender. It can easily blend any ingredient you put into it. 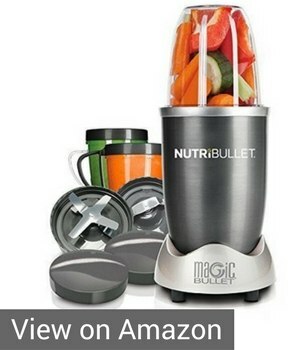 Very high reviews and slightly lower price than the Nutribullet 600. Well prices for the power that it delivers. Negatives: I don’t like that you have to hold the jar down during the entire blending cycle (usually 30-45seconds) versus Nutribullet will blend hands-free. Overall Opinion: If you want a small blender that won’t overheat easily like a cheap personal blender and has enough power to blend anything(nuts, vegetables, fruits, seeds) besides just protein shakes then the Nutri Ninja is a good option. It has 1000’s of strong reviews and offers good performance for the money. It is priced less than Nutribullet 600 but has more power. I personally prefer the Nutribullet’s hands-free performance but the Ninja is very popular. A good choice if you want to make smoothies as well as simple protein shakes. Side Note: Read my Ninja vs Nutribullet review if you are trying to decide on Ninja vs Nutribullet personal blenders. The Hamilton Beach Power Elite Multi-function blender(model 58148A) is a terrific value with 700 watt motor, 40oz glass pitcher with special pour spout lid, and multiple programmed blending functions. Positives: The Hamilton Beach Power Elite was my top value pick for Glass blenders as it has very strong reviews and offers a lot of performance and features for less than $30. It has a decent 3 year warranty and would be an excellent choice if you want an inexpensive full-size protein shake blender. Negatives: It won’t puree some hard ingredients or do horsepower-intensive blending jobs like making nut butter. Consumer Reports rated this blender as “Fair” in overall performance but it was comparing performance to more expensive blenders. Overall Opinion: A good value if you want a cheap countertop blender for protein shakes and other simpler blending tasks. 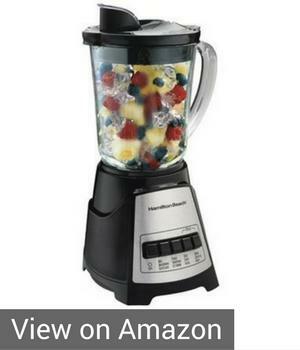 It has 1000’s of reviews and continues to be a top seller for people that want a decent blender for a very low price. Don’t expect it to blend everything but for simpler tasks it works great. The Ninja Professional blender is more of a workhorse blender compared to the Hamilton Beach blender above. 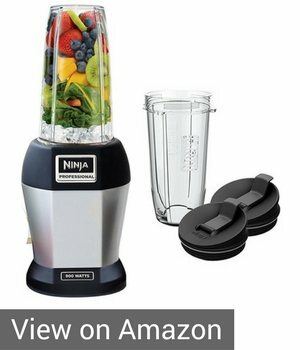 The Ninja BL610 is a best selling blender with a 1000-watt motor and large 72oz pitcher. It has unique “total crushing” blade to pulverize ice and hard ingredients. It has a sturdy feel and attractive look. Simple controls featuring 3 speeds and a pulse button. Positives: A powerful full-size blender that Consumer Reports rated as “Very Good in Overall Performance” across a range of various blending tests. Dishwasher safe. Negatives: The sharp blade can come out if the jar is turned upside down so use added caution when cleaning. Some complaints about the “total crushing blade” not blending fibrous vegetables as well as other ingredients. It is loud like other blender of this power. Overall Opinion: The Ninja Pro BL610 blender has 1000’s of reviews with a very high overall rating and performed well in various blending tests. Some people prefer a traditional blender blade rather than Ninja’s total crushing blade designs but it continues to be a top seller since 2010. If you want a blender that make protein drinks as well as crush ice, blend smoothies, and make full size batches then the Ninja BL610 professional is an affordable option. While I realize that the Vitamix 5200 is a little overkill when it comes to making simple protein drinks, the 5200 is an option if you are want a blender than can do anything and will outlast any other blender in the market. Yes, there are less expensive high-speed blenders that work well, but the Vitamix ranks at the top of more independent blender tests than any brand on the market due to consistent performance and reliability. There are a lot of Vitamix blender models and the 5200 is their classic, bestselling model that is purely made for performance. It has a 2 horsepower motor and variable speed controls. Positives: A proven workhorse of a blender than can handle a wide range of tasks and blend anything. Blends to a fine consistency and can even make hot soup out of ingredients because of how fast it blends. Negatives: The only negatives are price and it is tall at 20.5 inches so it won’t fit under a typical countertop cabinet. 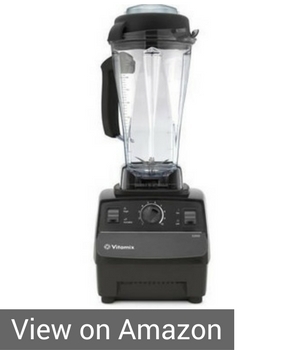 Overall Opinion: I only included the Vitamix 5200 for those who were looking for a commercial blender that can handle any blending task and will replace having to buy multiple cheaper replacement blenders over the years. It will create very smooth protein shakes no matter what you put in them. NOTE – You can save money by buying a factory refurbished 5200 which is like new but has a slightly shorter warranty than buying brand new. If you don’t have the budget for a Vitamix but want a powerful blender then consider some of the blenders that I listed in the Vitamix alternatives or best smoothie blender posts. I listed six top choices to consider when looking for a new protein shake blender at any budget. All of them will be perfectly fine for blending simple protein drinks with some offering more features and power to handle a larger range of tasks. If you have questions, please leave them in the comments below. Hello Ashwin, the # of blades isn’t necessarily the deciding factor. The horsepower/motor/pitcher design and the ingredients you add will have a bigger impact on the smoothie results than the # of blades. Most blenders use 4 prong blades including the top high powered blender brand Vitamix. Although, Blendtec(which is used is many commercial smoothie shops) blade only has 2 prongs and the blades are dull(not sharp) but Blendtec can puree everything. Some brands like Nutribullet integrate a 6blade into their blade design on some models like the 900 Pro so it can work for multiple use(4 of the blades are standard for blending and the lower 2 blades are ideal for milling/grinding). For personal smoothies, the Nutribullet or Ninja personal blender models listed above both work well for all types of smoothies. The Oster MyBlend won’t work as well for smoothies. Do any of the smoothie makers you reviewed able to fit mason jars ? Mason Jar blender review for good overview. Excellent article, Thank you Does the Nurtibullit work well in chopping ice in addition to vegetables. Does the chopping of ice wears down the blade or machine in general. Do they have warranties? Yes Nutribullet can chop ice but the blades aren’t designed to crush ice as a standalone ingredient and Nutribulet specifically warns that ice should be less than 25% of your total ingredients when making a Nutribullet smoothie. For the Nutribullet specifically blending just ice could break the blade and void the warranty. Mainly you need to use liquid in a Nutribullet with ice or frozen ingredients for proper blending. Otherwise on most blenders ice is fine. 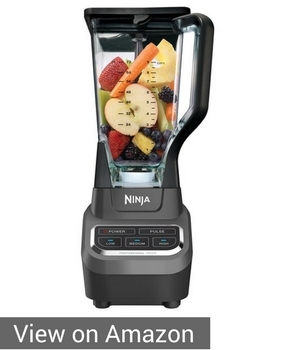 The Ninja Pro blender mentioned above has unique blade design that works great at crushing ice. Powerful blender like Blendtec or Vitamix can easily crush ice. Weaker blenders(under 600 watts) will struggle a little. Hi Anna. Thank you for your review. I M going to buy a new blender, my doubt is between the new ascent vitamix or 5200 classic. Hello Riccardo, It kind of comes down to personal preference for what features you want. The blending results are similar but the Ascent comes with a wide jar so it isn’t ideal for small batches whereas the 5200 jar can work with any batch size. The Ascent motor is slightly more powerful because of the wide base jars and performs like the G series blenders. The Ascent offer a longer warranty but they have more electronics to deal with. I like the classic style Vitamix blender but the Ascent longer warranty and latest features are worth considering. A reconditioned C series though is a good price. Read our Vitamix Ascent review which summarizes our thoughts.